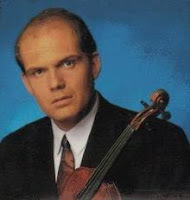 Jaap van Zweden is a Dutch violinist and conductor born on December 12, 1960 (Perlman was 14 years old.) His father was one of his first teachers in Amsterdam. In the U.S., while still a teenager, he studied with Dorothy Delay at Juilliard. In 1979 (at age 19), he was appointed concertmaster of the Royal Concertgebouw Orchestra, the youngest to ever hold that position. He left the Concertgebouw in 1995 and gradually moved toward a conducting career - Pierre Monteux, Charles Munch, Eugene Ormandy, Theodore Thomas, Alan Gilbert, and David Zinman were also highly accomplished violinists who became conductors. Van Zweden became a full-time conductor in 1997, his post with the Netherlands Symphony Orchestra being one of his first (1997-2000.) In 2005, he became the chief conductor of the Netherlands Radio Philharmonic and will also lead the Dallas Symphony (from 2008) until 2012. In addition, he will simultaneously lead the Royal Flemish Orchestra (Belgium.) I do not know if he even still plays the violin. However, here is proof that he was indeed a virtuoso violinist at one time.